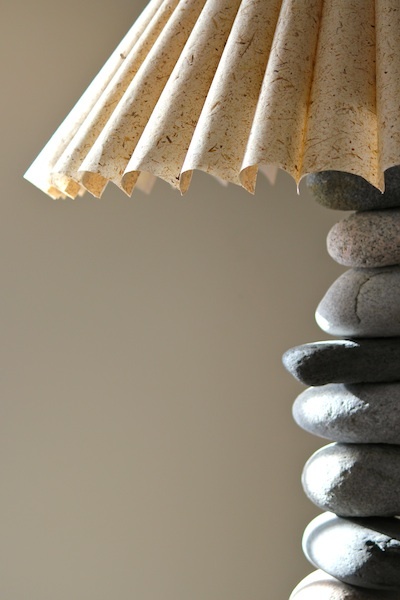 While traveling, I had seen a table lamp made from smooth ocean stones, I loved it. 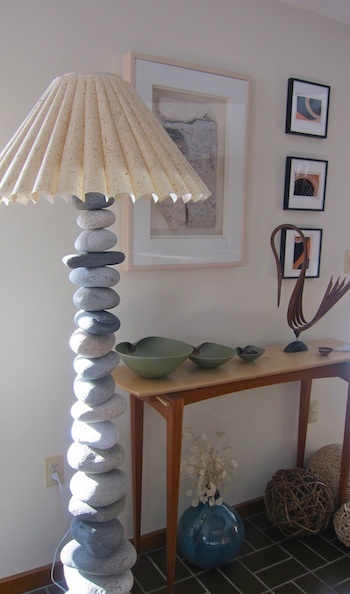 My husband, David and I decided we wanted a floor lamp and we would make it ourselves. 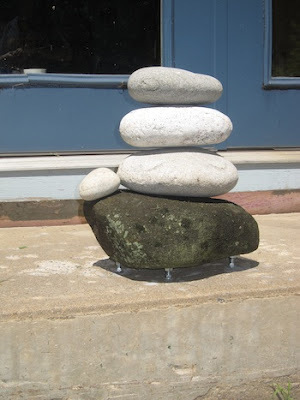 This really wasn't too extreme an idea because my husband had given me a rotary percussion drill for an earlier birthday to create a stone sculpture. When you live in a DIY household you get and give weird gifts. Together we tackled the project. The finished lamp is a beautiful blend of nature and design. It attracts endless attention from visitors. And it will never be moved assembled. It weighs hundreds of pounds. Here is how we did it. 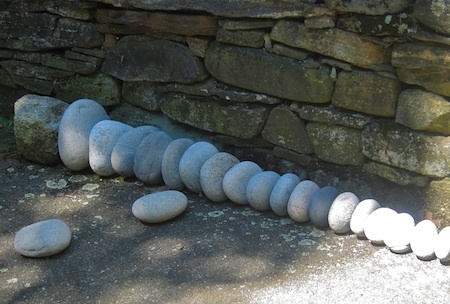 It started with us lining up my rock collection. I've been collecting beautiful stones for a long time. We even travelled to the Rhode Island shore to supplement the collection. I wanted a gradation in size but with a variety of colors. We started by finding a larger base rock in our woods. We added 4 adjustable bolts to the bottom so we would be able to level it once in location. You can see those look like tiny legs on this turtle like stack. 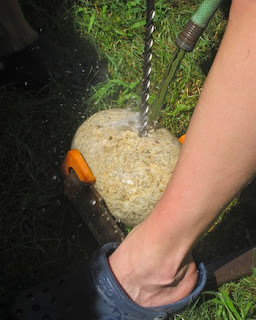 We then used large wood clamps to hold each rock in place and drilled a 3/4" hole through the rock. Water was being applied the entire time to keep the bit cool. We tried a variety of techniques to try and prevent the rocks for chipping on the bottom side but were never successful. In the end it didn't really matter because they stacked together better as is. 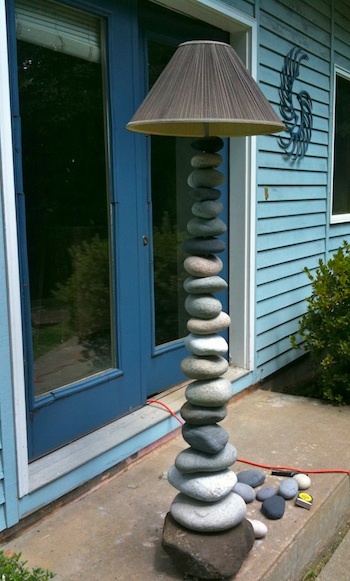 Here the lamp is 4 stones high. 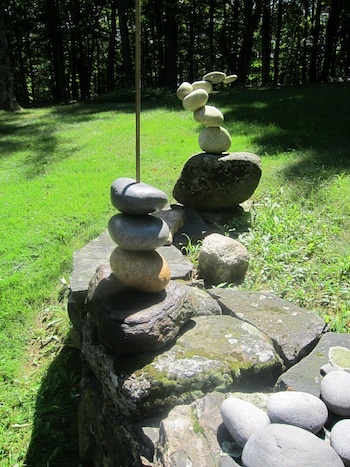 In the back ground you can see the stone sculpture we had created previously. It was for this sculpture we purchased this impressive drill. It really needed a second project! Drilling was a very, very slow process. We spread it out over two days and enlisted the help of daughter, Karen as well. We estimate it took about 10 hours of drilling time to complete the lamp. We also learned that it takes multiple bits and goes a lot faster with a new sharp bit! Progress is clearly visible. We placed a 3/4" brass pipe in the center and slid the drilled rocks over it. We constructed it so it comes apart which is absolutely necessary for moving. There is no glue, just the stack with the internal pipe. We had a major design problem in that we didn't have a shade that was the correct proportions. I did a lot of searching online and couldn't find the proper size/color combination anywhere. It really looked silly with the undersized shade. Finally, it was clear that I'd need to make the shade. Unfortunately I took no pictures of the process. I did buy a smaller, plain shade as a base and created a kraft paper mock-up on top. I purchased a beautiful but relatively stiff rice paper with natural chips at Jerry's Art-o-rama. From that I crafted a shade with a beautiful texture. I could make it exactly the size I wanted. I cut long triangles and used double stick tape to hold the edges together creating a scalloped shade. 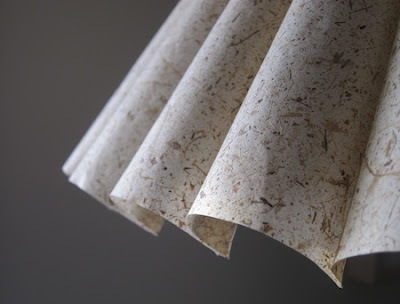 The end result is visually soft and natural. It is a perfect addition to our home of eclectic fine American crafts, homemade treasures and found things from nature. Wow!! I mean, wow! That was definitely worth all the work. Holy cow. That is one impressive lamp! This is great! I want to make this too but how do you incorporate the electrical portion to the lamp? 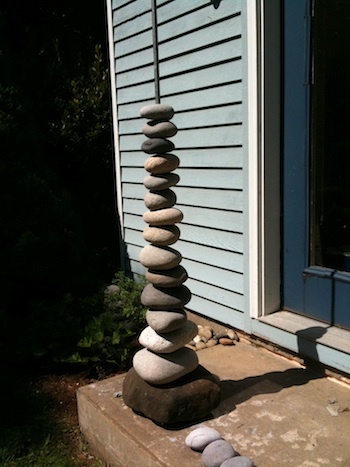 I am interested in your stone sculpture! Do you have a post on it?